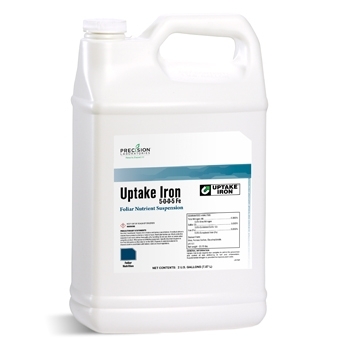 Uptake Iron is an organic iron complex to aid in the prevention and control of iron deficiency in turf and ornamentals. Uptake Technology formulations include adjuvant technologies for spray solution buffering, spray characteristics, leaf wetting and leaf surface tension. For cool and warm season grasses apply 1-3 fl. oz. per 1,000 sq. ft bi-weekly as needed. Rates may be adjusted to accommodate the specific nutrient needs of the turf. For ornamentals apply 1-2 qt. per acre in sufficient spray solution to provide adequate coverage.